Starting Over After Google Penguin Killed My First Blog! In this post, I want to share with you the story of how my first blogging venture with “Magnet4Marketing” came to an end after it was hit hard by Google Panda and then Google Penguin, and why starting over was the best decision I ever made. Way back in 2012, when Google was making big changes to its search engine algorithm, in an attempt to make the web a better and less spammy place, many websites and blogs, unfortunately, fell victim to what was called Google Panda and Google Penguin updates. Of course, many websites rightly deserved to be affected by this update, but there were also many websites that sadly fell in the line of fire, as in, were penalized for no or minor reasons. My blog, Magnet4Marketing (before I launched Magnet4Blogging in 2013), was amongst the many, many thousands of blogs affected in 2012. I started Magnet4Marketing in 2009 and took it offline in March of 2014. Google Panda, and eventually Penguin, penalized my blog to beyond the point of recovery, and I did try for several years to try and fix some of the problems the site was experiencing. Magnet4Marketing wasn’t the only blog that I had that became affected by Google’s algorithm changes. I also owned a few other micro-niche sites, and a personal blog (OnlineIncomeJournal.com) which I had to take offline due to a massive loss of traffic and revenue. I knew I wasn’t alone and my site wasn’t the only one affected. Countless threads on forums and blogs popped up regarding the updates. I saw many other fellow bloggers and friends forced to either start over or quit blogging altogether. It was sad to see this. I read countless stories of how some bloggers and marketers were actually forced to find alternative jobs, because, for many of them, blogging was their business, it was their livelihood. My first blog Magnet4Marketing at the height of its “small success” was generating over 15,000 unique visits per month, and around 25,000 monthly page views. The site was generating between $1,500 and $3,000 each month in the form of Google AdSense, private ads sales, and a solid affiliate marketing model. If you take a look at the screen capture below, you will see over the period of a year and a half, how my organic search engine traffic tanked from almost 700 visitors per day to just 40 visits per day. 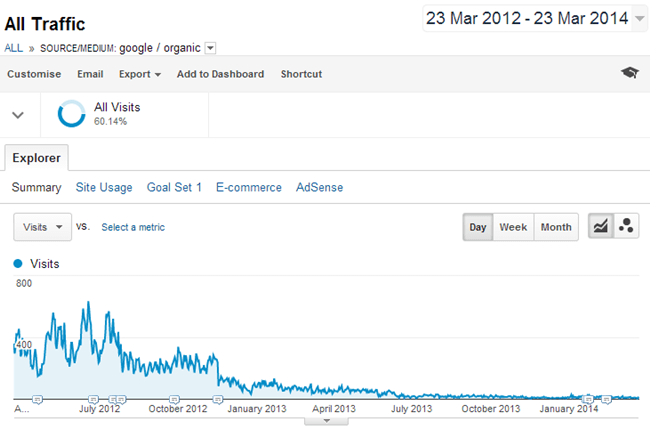 What caused Google to penalize my blog? I really don’t know for sure, however, I have a pretty strong suspicion that it was the result of negative SEO. Asides from guest blogging, blog commenting, and doing a little article marketing here and there, I never really paid a great deal of attention to building links in any other way. What I found, however, when I carried out a link audit on Magnet4Marketing, there were pages after pages of unknown spammy links to sites that were completely unrelated. What did I do to try and recover? Like a lot of online business owners and bloggers that were struggling to regain their search rankings back during that time, I made attempts to try and fix my blog the best I could. I didn’t want to see it go to waste, of course not, so I started my plan of attack. Looking back today, I was actually wasting my time, my money, and valuable resources. In addition to the time and money wasted, I was also putting a little bit of my health at risk. I would sit in front of my laptop for long hours, day after day, night after night, mostly doing things like link analysis, link profile building, disavowing bad links, literally trying everything I could to try and fix my blog the best I could. 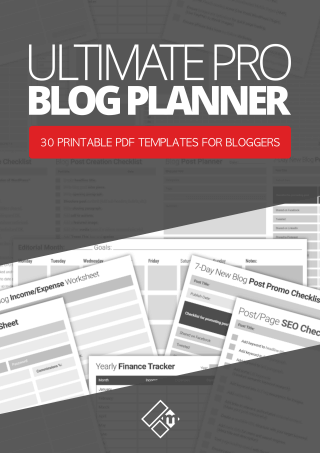 I went out of my way to hire reputable blog writers to create more useful content. I spend hours crafting new content myself. Lastly, I completely redesigned my blog from scratch, removing everything and anything that I thought was creating a bad user experience. But of course, all of this was just a waste of time, because none of it worked, at least not for a penalized site. Finally, in March of 2014, I decided that enough was enough and I took Magnet4Marketing offline. I had two choices after taking Magnet4Marketing offline – Start over with a brand new blog, or just give up entirely and move onto the next thing. After taking a few months to cool off, I decided to start over. 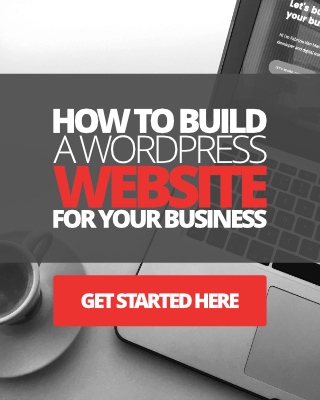 I had already purchased the domain name Magnet4Blogging in October of 2013, and in March 2014 I decided to go all out and build a brand new blogging/personal brand business from scratch with this domain name. Why starting over was the best decision ever? I can tell you right now, as of updating this post in November of 2018, that starting over was the best decision I ever made. Since launching the site, Magnet4Blogging Media has gone from strength to strength, and not just because I decided to start over fresh, but because I started over with a new frame of mind. I remember reading somewhere online that bloggers are rarely ever successful with their first blog. I didn’t believe it, but I do now. I learned from the mistakes I made with my first blogging venture, so I knew why and where not to make those mistakes again. I was also starting over a lot more knowledgeable than I was when I started blogging. So, doing things like – installing WordPress, styling a theme, installing and configuring plugins wasn’t so much of a learning curve. I was a better blog writer. I had already made a few connections with other bloggers and influencers previously with my old blog. If I didn’t start over, all of this would have gone to waste, right? More over, I made a promise to myself. That promise was to never rely on a single source of traffic for my website again, that being just ‘search engine traffic’ alone. Why you should start over too? If you have a small or medium sized blog that was hit by any of Google’s algorithm updates. And, if you genuinely believe that you have done everything you possibly can to try and recover your lost rankings, traffic, authority, and revenue, then here’s my advice to you! There is no shame in admitting defeat or failure. Heck, I failed with my first blog and I’m proud of it. I’m proud because I wouldn’t be where I am today with Magnet4Blogging Media. And, the great thing about starting over is that it’s never too late to do it. By starting over with a brand new blog, you have a brand new opportunity to be even more successful than before. You are starting over with far more experience and knowledge than ever before. You are starting over completely aware of the things that you should be focused on, and the things that you shouldn’t pay attention to. Sure, it’s going to take a long time to rebuild a credible blog like you had before from the ground up, but it’s never, ever too late to start. The only time that it’s too late, in my opinion, is when or if you do nothing about it now. As I have experienced starting over in blogging, I’m here to help you do the same and be more successful than ever before. Feel free to connect with me, or get in touch if you need me to answer any questions, or provide you with some further guidance. I’m here to help YOU. Below you’ll see that I’ve outlined some of the best blog posts I recommend reading on Magnet4Blogging for bloggers looking to start over with a brand new blog, as well as tools and resources to make use of. 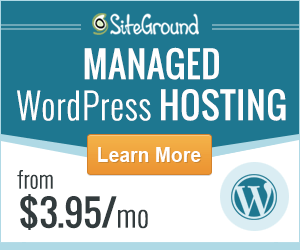 How to find the best hosting service for your WordPress blog. Start a WordPress blog guide. 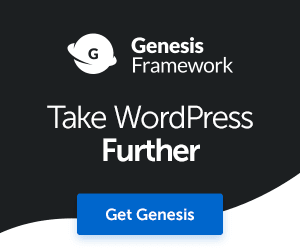 Checklist for starting a WordPress blog. Best premium WordPress plugins for bloggers. 30 Ways to make 2019 your best blogging year yet!